If the Consumer Reports Quality Survey were the Olympics the Japanese companies would have won the gold medal, and the silver medal, and the bronze. Then, heading back to their Olympic village they would win the door prize raffles. The next day they win the charity golf outing. Despite an outstanding public relations effort on the part of the other automakers, the fact remains that the Japanese companies that make cars are ranked highest by the people who actually buy and drive the cars. Toyota’s three American brands swept the podium with Toyota/Scion/Lexus taking the top 3 spots. This should not come as a surprise. Earlier this year in J.D. Power and Associates’’ Initial Quality Study (IQS) Toyota/Lexus took top honors. Despite a constant and unrelenting barrage of criticism from the auto media and competitors advertisements, the Toyota products work. For example, in a recent television advertisement a new car by a low-rated company on the CR list is highlighted by the spot in comparison to a Camry. The person in the commercial goes on and on about the car then looks at the Camry and says “I can’t believe this is a new car.” The Camry’s customers can believe it. The lowest ranked vehicle is Jaguar. Jaguar is barely a mainstream automobile company in the US, but that should be no excuse. The lowest sales volume cars at Chevy and Nissan, the Volt and Leaf respectively, did very well in the study. When the volume is so incredibly low, the company should be able to take care to get it right. Ford and Lincoln are the two lowest rated mainstream, high volume car manufacturers on the list. One has to ask, if Lincoln is a luxury car without a rear-drive platform for its cars, or a V8 engine in its top sedan, and it is the lowest ranked “luxury car” in terms of quality, why is Ford pressing on with the brand? Making up the rest of the bottom of the list is Italian company Fiat’s brands marketed in the US. Jeep, Chrysler, and Ram finish in the bottom third with Ram fourth from the bottom. Interestingly, Consumer Reports tries to throw Ford a bone in the summary it provided on its website saying “…Ford Escape and Fusion, and the Lincoln MKZ—are not included in the analysis. They were redesigned for 2013, and we don’t know how the new versions will fare.” Actually, there is some strong evidence as to how the Escape will fare. If has been recalled for multiple problems. In one recall Ford actually advised the Escape drivers not to even re-start the car, but to have it towed from its spot to a Ford dealer for risk of fire. In our own first exposure to the vehicle, the Escape’s signature automatic tailgate did not work despite the Ford representative’s valiant efforts. 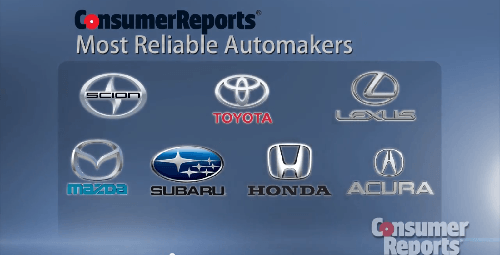 The significance of the Consumer Reports Quality Survey, and the J.D. Power and Associates’ IQS is that the information comes from us – the people who actually drive the cars. All the CR and J.D. Power people do is compile the data and try to present it factually. What we as drivers overwhelmingly report is that the Japanese brands have the highest quality, the American and Italian brands have the lowest, and shockingly, the brands considered to be “Luxury” makes like Mercedes, Cadillac, and Lincoln are not even as high in quality as Kia, once thought of as an economy brand.